(WINDSOR, ON) – With Aaron Sanders in the booth calling his 100th Windsor Express game, the Island Storm settled in Windsor to make up a weather re-scheduled tilt from January. A single from the line for the Storm opened the scoring, but Windsor’s Chad Frazier got it back and then some when he dropped three from outside. Frazier sent a message when he telegraphed another from downtown on the next trip up court. Despite Frazier hitting four treys before the halfway point of the period, the Island Storm managed to keep pace, and even lead the Express for the majority of the time. In the latter half of the quarter, the visitors extended the margin to 8 points as they took advantage of Windsor miscues. A strange exchange between Kevin Loiselle and Brad States resulted in the officials making the two players shake hands. By the horn, however, Windsor had eliminated the deficit on the strength of the long bomb, to lead 33-29. Windsor jumped to a 7-4 run to start the 2nd quarter, but the Storm wouldn’t roll over for them. The pair exchanged scoring plays through the period with the Storm sneaking in front with2:29 left on the clock. Three points separated the teams as the seconds clicked off, Windsor attempting to stay competitive and the Storm trying to establish their dominance. The Express won the battle by forcing their way to a 50-47 half time margin. Carl Hall, coming off the bench for the Island, led all scorers with 14 points. Chris Anderson and Tyler Scott both had 12 for the Storm while Frazier and Shaquille Keith dropped 12 apiece for the Express. The Island stormed the beginning of the 3rd quarter and leapt in front of Windsor by as many as 8 points. Windsor, again, started to dig themselves out of the hole. When the buzzer sounded, they had succeed in reducing their task to 4 points as the Storm led 76-72. Hall continued to hold the game high in points with 22 and Scott and Anderson continued to follow with 15 each. 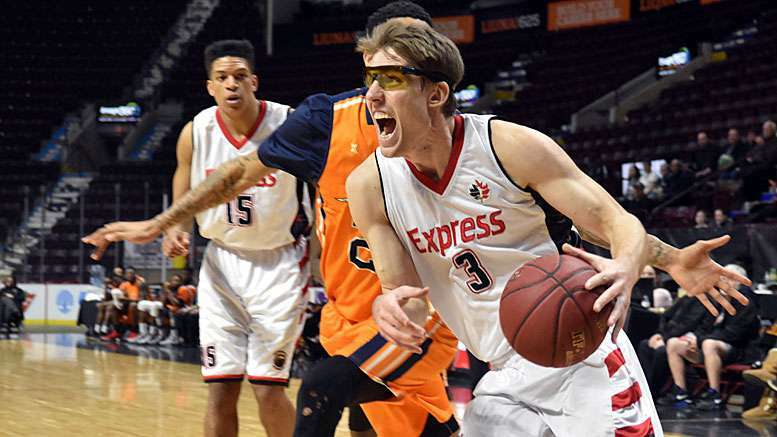 For Windsor, Keith added 6 points to his 1st half total to lead the Express going into the final frame. Frazier came out for the 4th and offered up a jumped and a drive in the paint to close the Express to a single point. Cue the Storm for an early timeout. Returning from the break, Omar Strong put up a triple for Windsor as the home side regained the lead in the contest. Strong’s effort was matched by another trey from Frazier, even though Storm head coach Tim Kendrick claimed he travelled while passing through the paint. Frazier then knocked down another jumper for two to add insult to injury. Though Frazier and the Express racked up the points, the Strom quietly stayed even with Windsor and even pulled ahead 89-84 with 5:32 left to play. The Storm went up by two more on a broken lay in the paint, but Windsor came right back with a bucket from Keith. two trips up court for the Storm were sent packing by the Express, but they couldn’t capitalize to close the score. A Storm jumper followed by a triple by Franklin Session resulted in a 10-point spread and a Windsor timeout with 2:04 remaining. Two from the line by Kemy Osse made the task even bigger for Windsor. Maurice Jones dropped three from the stripe to make it a 9-point game, but Windsor put Hall on the line where he made 1-of-2. A two-handed slam by Du’Vaughn Maxwell sealed the fate of the Express, 104-91. The Island Storm are now on a 6-game winning streak and pushing for a playoff spot in the East. They sit a half-game behind the Saint John Riptide, who are on a 2-game skid. The Tide will be in Windsor on Friday to test their luck against the Express. “We’re in the stretch run of the season,” Jones said. “We have seven games left as we get ourselves ready for the playoffs. In order to get us back to the level of our last game, we have to play. And, we gotta be able to play together as a team. The playoff teams have been settled in the Central, but Windsor is still within reach of both 2nd place St John’s and division leading London, and the coveted home court in the first round.